Monday’s aren’t really the best day for anyone, are they? I mean, it’s the first day after what feels like a too-short weekend and a majority of us are feeling a bit sluggish—and maybe not as motivated to get back into the swing of our workout regimen. That said, the best way to get back on track is to get back in gear and my plan today is a bit different from my normal Monday approach because, as opposed to easing into my routine, I plan to go as hard as I can. Last week saw me only putting in four days as opposed to my usual five or six—between Christmas shopping, PTO responsibilities, and shuttling my kids to and fro, I just didn’t have enough hours in the day—and I can feel those missed days in my overall attitude towards getting my routine in this morning. The best way to combat an urge to be half-assed is to do everything in a turned up manner. Just lay everything on the line and remind your body that you haven’t forgotten how to step up to the plate and challenge it to work at keeping, getting, or improving the physique you’ve spent so much time cultivating. Monday’s aren’t fun for me by any stretch, but this Monday I’m taking it up a notch just because I can dammit!! Now, lets get it, lets get it, lets go!!! So, it’s an all-cardio day for me today, and anytime I come across a new workout that challenges something I’m currently doing, I’m all over it! 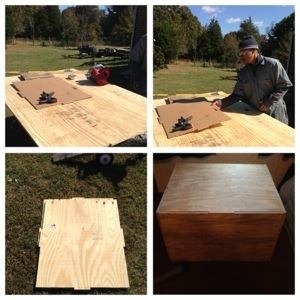 Here’s some backstory on my ‘Plyo Box’: a couple months back, my wonderful hubby gifted me one for our anniversary. I’d been eyeing one at Rogue Fitness for a few months, but wasn’t feeling the price tag—the box they sell through their online site would have set me back about $150.00, and I wasn’t about to drop that kind of coin with the holiday season so near. So, anywho, my plyo box is 20″ at one side and 24″ at another, and I’ve incorporated it into my cardio workouts on a regular basis for a few weeks now. However, I ran across this workout on my Facebook feed and thought it was a perfect addition to my routine today as I typically utilize my box as an ‘active rest’ station as opposed to a workout all it’s own. The lovely thing about box jumping is it gets your heart rate up in a very short period of time because you’re utilizing so much force and energy to get from the floor to the top of the box. And, the greater the speed, the more breathless the set leaves you. It’s definitely a great HIIT workout (HIIT=High-Intensity Interval Training). If you have a box, you should give this one a try. If not, I recommend mixing in some HIIT anyway. For instance, if you’re the running type—mix in some quick 10-15 second sprints. If you swim, add in a relay or two between laps. If you bike, mix in some sprints. The important thing is to that you get your heart pumping and kick your metabolism into overdrive! What are you waiting for, get moving! Can I get a bit vulgar for a moment? Here, I’m calling ‘ear muffs’ on this one as a means of letting you know ahead of time that I’m going to say something which requires a bit of ‘Parental Discretion’, so get ready…here it goes: I’m a natural tease. I like to make my Monday workouts a touch less intense than the rest of the week, and I do so as a means of staying hungry for the next one. My reason is simple: I want a workout that taxes me, but no so much that it brings me to my knees, so that I can’t wait until the next one! At about the point that my endorphins start raging—and I begin to feel like superwoman—and knowing full well I’m capable of going 30-45 minutes longer—I stop my workout completely. I turn off the music, take off the weight gloves, put away the plyo box, take off the heart rate monitor, and close the door to my home gym; I walk away from my routine and continue on with the rest of my day, doing nothing which even remotely resembles a workout, of any kind. It’s a hard thing for me to do, too, because after taking a rest day on Sunday, my body is already primed and ready for a good, long, workout, but I deny it the pleasure of one—no apologies, no explanations—just leave it completely unsatisfied and wanting more. Now, if you can clear the semi-dirty thoughts the tone of that last paragraph brings to mind, and focus on what I’m saying, we can continue *wink, wink* (see what I did there? told you…tease). For me this is something that works wonders for my motivation the rest of the week because by the time I hit my Tuesday session, I’m ready to get spent. I mean, I am so keyed up and ready for some high-intensity satisfaction that I can hardly contain myself. The calories I’m able to expend, the overall effort I’m able to devote to each rep, set, and Tabata-style workout is something that’s hard to describe…but it’s certainly a rush! My aim here is to say that you have to continue to find ways to stay excited about getting/staying fit. If you’re a fitness fanatic—and you work out six days a week—you have to get creative sometimes if you hope to avoid getting burned out, and it’s little tricks like this that have helped me to curve the random urges to forgo a day altogether because I’m over it all by Thursday. It’s something that works for me, but you have to find something that works for you. That said, it’s Tuesday and I’m ready to get busy, *wink, wink*.